If you're a film lover, you were immediately saddened about the untimely passing of Heath Ledger. If you didn't care at first, you almost certainly did after watching The Dark Knight, if for no other reason than for the future of that franchise. He created one of the most terrifying villains to ever grace the screen with the Joker and it really is a shame to know that the next Batman movie will lack his presence. Worse still is that he would have undoubtedly dazzled us with many more movies for years to come. Hollywood is hurting without him. Although most will always think of him as the Joker, he was in the process of filming one more movie when he died, The Imaginarium of Dr. Parnassus, a quirky little fantasy tale about love and immortality that, unfortunately, never fully comes together. Christopher Plummer plays Dr. Parnassus, an old man who travels the country performing a stage show with his vertically challenged friend Percy, played by Verne Troyer, his daughter Valentina, played by Lily Cole, and a boy in love with her named Anton, played by Andrew Garfield. The 16th birthday of Valentina is fast approaching and Dr. Parnassus finds himself troubled because in a deal he made a thousand years ago with the Devil, he agreed to give up any newborn once they turned 16. In exchange, he earned immortality and the ability to guide the imaginations of others as they walk through the centerpiece of his show, a mystical mirror. Eventually, the Devil makes another offer to Dr. Parnassus. If he can capture five souls in two days, before Valentina's birthday, he can keep her. To do this, he must attract people into the mirror and he finds help in Tony, played mostly by Heath Ledger, a mysterious man with amnesia, who uses his allure to whisk people into the imagination world. You may be wondering what I meant when I wrote that Tony was played mostly by Heath Ledger. You see, when Ledger passed away, he had already filmed all of the scenes that took place outside of the mirror in the real world. Filming in the fantasy world was yet to begin, so according to many interviews, including this one from Comic-Con, Terry Gilliam, the writer and director, rewrote an early scene to explain that when somebody ventures into the mirror, that person's face can change figure. Stepping in to complete the movie are notable actors Johnny Depp, Jude Law and Colin Farrell, who nobly donated all the money they made on the film to Ledger's daughter. Although it is saddening to see the switch in persons, knowing full well Ledger is not with us anymore, one can't help but admire the imagination it must have taken to overcome this difficulty, being able to finish the movie while still allowing it to make sense narratively. However, as much as I hate to say it, that's about as imaginative as the film gets. I was more impressed by the way they solved this problem than with the actual product itself. 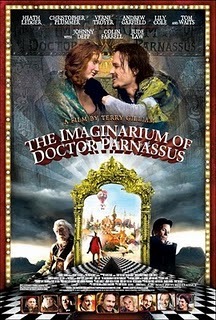 For a movie about a fantasy world where imaginations come to life, Dr. Parnassus is strangely unimaginative. I found myself bored by the visuals which did little to represent the imaginations of the people in the mirror. Being a fantasy film, that's a big deal. It's not so much about what happens outside of the mirror, but rather what happens inside of it. Even if it were flipped around, however, you could still color me unimpressed. The story was simply uninteresting. I never sensed a genuine threat from the Devil, I felt that the third act personality twist of a certain character was pulled out of thin air, and the whole thing seems muddled, rarely explaining certain aspects of the film that needed explanation. Now, the performances are good and the actors do what they can to sustain the movie, but when your run time is over two hours long, you need a better script and better visuals. As it stands, Dr. Parnassus has neither. I can feel my stomach turning as I write this because Ledger's life should be honored and his final performance demands to be seen. It's a close call, one that sickens me to no end, but I'm going to have to recommend you skip The Imaginarium of Dr. Parnassus.